I had a chance to visit Bohol,our country's 10th biggest island, last March 5 and 6. We stayed in a Superior deluxe room at Dumaluan Resort. Due to a tight sked,our itineraries are really 'paspasan'. After checking-in,we immediately boarded a boat which will take us to the Balicasag Island. We were supposed to have dolphin watching but the boatman told us that dolphin seldom surface by that time(it's 3pm then). It's advisable to have dolphin watching during the morning. And so ,we have no choice but to have snorkeling instead at the Marine sanctuary. The following day was a busy day- our Countryside tour. 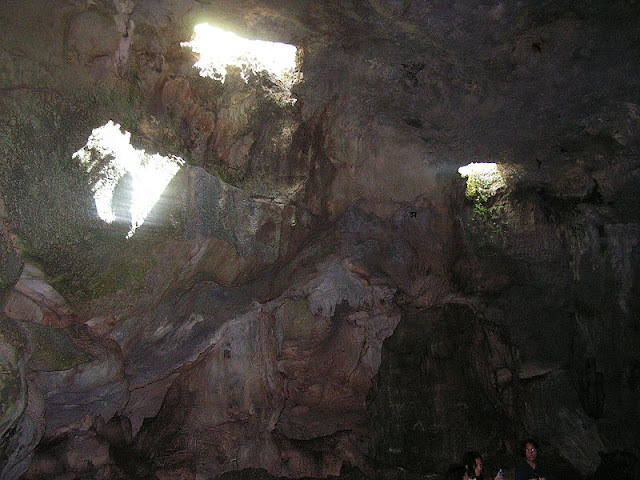 1st stop: Hinagdanan Cave. I've always wanted to visit caves and this particular cave is outright amazing..Great stalactite and stalagmite formations..I can tell this a very much 'alive' cave as manifested with the dripping waters from the stalactites. It has a man-made spiral ladder that leads to an underground pond where both ends are open. 2nd stop: Blood compact Site. This historical event took place on March 16, 1565. It commemorates the friendship of Rajah Sikatuna and Miguel Lopez de Legaspi..making Bohol the City of Friendship. However, I learned that the site isn't actually the exact site were the event happened..awww!The view from the site is marvelous.You shouldn't miss a photo op. 3rd stop: Chocolate Hills. It's a long and some winding road to Carmen, Bohol- home to the world famous Chocolate Hills. It's more than 200 steps up the deck in Carmen to catch a great view of the hills. Our feet and legs literally surrendered but the high point is worth climbing. The hills were a formation of limestones and clay. 4th stop: Man-made forest of Bilar. I so love this area! During the 1950's, the boy scouts of Bilar planted Mahogany trees to prevent soil erosion. Now, the trees were all upright tall and this location has become one of the more sought place in Bohol. I wish we can have these in Kalookan too. 5th stop: Hanging Bridge. 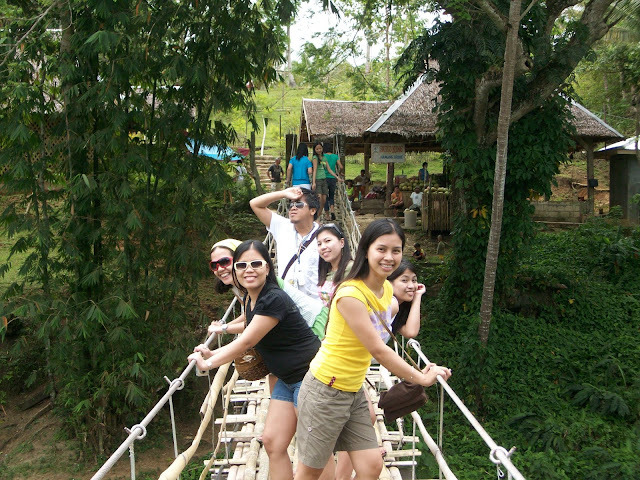 Before taking lunch at the Loboc River,we stopped by a Hanging Bridge. I supposed this isnt really a tourist destination,but what the heck! Crossing it is..ummm..an experience. Dulce,my buddy, enjoyed jumping- scaring the others crossing it..
6th stop: Loboc River. This is the famous river featured in Cesar Montano's Panghoy sa Suba. This is where we had our buffet lunch..Love the food!Love the calm waters..I enjoyed the serenade..I was entertained by the welcome song of the 'pink ladies' of Loboc.. The cruise was really relaxing. The whole trip lasted for more than an hour and at the end is the Busay Falls. 7th stop: Tarsier. Finally, I got the chance to see a real Tarsier. I remember we used to tease an elem classmate a tarsier..This cuties can't be touched and when they are unhappy,they commit suicide..sad.. so we were content taking pictures of these lil creatures na lang..
8th stop: Clarin Ancestral House. This a national heritage. Amazing how it has been preserved since this has been built during 1840. Inside you can see the antique sala,dining room,bed,some Filipiniana and barong,old cabinets,jars and chinawares and pictures of the famous Clarins of Bohol. 9th stop: Prony, the python. Prony the python is considered the largest reticulated python in captivity in the Philippines. Owners of Prony claim that they caught the snake near their house way back 1996 and from then on treated the snake as part of their family. Prony takes a bath four times a day and eats a whole 60-kilo of live pig once a month. Now, that is a huge appetite! I went inside the cage and had a picture with Prony. 10th stop: Baclayon Church. Built in 1596, Baclayon Church is the oldest in Bohol and second in the whole Philippines. Im glad we stopped by a church during my Bohol stay, since I always wanted to visit one in every place that I go to. Inside the church is a museum where old stuffs, garments, images, pictures and some memorabilia of the church are preserved..Going around the museum gave me creeps. I fell in love with Bohol. I love the serenity and the beauty of the place. The beach place isn't that great as compared with Bora. They have no gimik nights here except for a band performing in our resort ( where I performed 2 sets,mind you..hihihi). I'll recommend Bohol to those who would like to have some quiet and relaxing times preferably with your partner..Not so much for a barkada getaway,as they might get bored for the lazy night stay.. 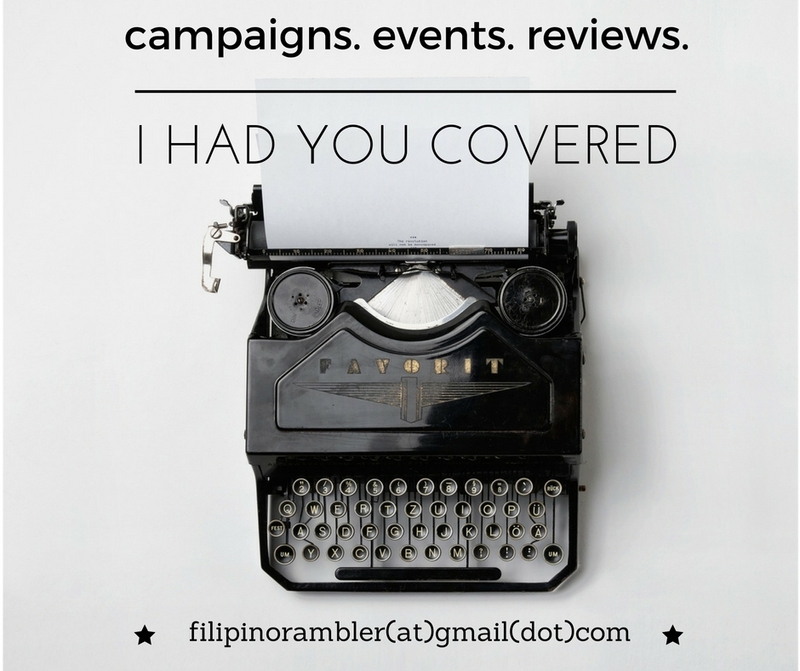 I'll definitely visit Bohol again-but with my partner na..So there..